Some Doctor Who writers come along and just instantly "get" the show. In the Russell T. Davies era, it was former Who novelist Paul Cornell ("Human Nature," "Family of Blood") and superfan/future-showrunner Steven Moffat ("The Empty Child," "Blink"). After Moffat took the reins from Davies, Being Human writer Jamie Mathieson ("Flatline," "Oxygen") became the go-to for guaranteed sci-fi gold each season. Now, I'm not saying Wentworth writer Pete McTighe belongs in that same echelon, but as far as first episodes go, "Kerblam!" certainly demonstrates a grasp of what makes Who so compelling: an otherworldly setting, a sinister villain, and a big problem for the Doctor to figure out. Sprinkle on top some sociopolitical satire, a little bit of humor, and emotional character moments, and you have all the ingredients for what should be a stellar episode. Unfortunately, McTighe's script botches the ending of what was otherwise one of the more imaginative episodes of the season. Showrunner Chris Chibnall penned the hourlong episode. Initially, the episode appears to be taking a swipe at big corporations like Amazon (and similar online retailers). The Doctor (Jodie Whittaker) receives an overdue package containing a Fez - a neat callback to Matt Smith's Eleventh Doctor, who took a liking to felt hats. 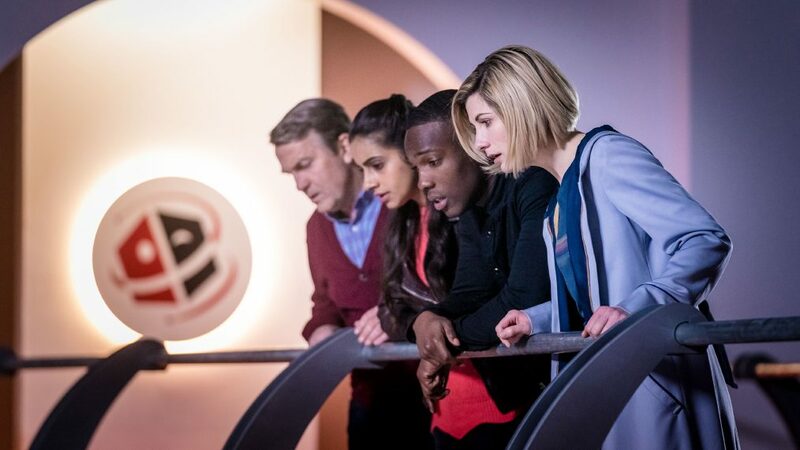 Yaz (Mandip Gill) notices that the words "HELP ME" printed on the packing slip, and so, with that, Team TARDIS set upon an investigative mission to the warehouse of Kerblam, the galaxy's largest retailer. Built on one of the moons of the planet Kandoka, the Kerblam warehouse is a mammoth operation, with its labyrinth of conveyor belts and creepy robot taskmasters. The so-called "TeamMates" sort of look like if CP30 had painted himself silver and got a job as a postal worker. Kerblam is an almost fully automated workplace, with just 10% of the staff made up of humans, or "organics," as Human Resources manager Judy Maddox (Julie Hesmondhalgh) casually refers to them. We meet some of those humans as the Doctor and co are assigned jobs within the futuristic factory. There is Dan Cooper (a brief cameo from comedian Lee Mack), a dad-joke cracking, blue-collar grafter, who is just trying to keep his head down and provide for his six-year-old daughter. There's Kira Arlo (Claudia Jessie), a hardworking young girl with a positive attitude but seriously lacking in self-confidence. And Charlie Duffy (Leo Flanagan), an amiable maintenance boy, with an awkward work-crush on Kira. We spoke with the man behind 'Demons of the Punjab' about bringing this period of history to life for the small screen. These are arguably the best written, and performed, guest characters of the season so far. Jessie and Flanagan, especially, make the most of their limited screen time to bring Kira and Charlie to life as relatable, flawed human beings. Mack's appearance is short-lived, but he serves his function as the sacrificial Dan. And Hesmondhalgh, who has worked with Chris Chibnall before on Broadchurch, brings her always reliable sparkle to a character who on paper doesn't necessarily jump off the page. It soon becomes clear to the Doctor and co that not all is well at Kerblam. There are the obvious HR issues. Human workers shackled with "GroupLoop" bracelets to track their productivity. Corporate propaganda blasted over the loudspeakers. Controlled and monitored breaks. All of this gives the episode some real oomph; even when McTighe's dialogue falls a little flat, I appreciate his willingness to tackle topics like the automation of jobs, customer privacy, delivery drones, etc. It feels like a less violent version of Charlie Brooker's "Metalhead" episode of Black Mirror. The bigger issue is that workers have been disappearing, including Dan, who after bonding with Yaz is eviscerated by a seemingly malfunctioning TeamMate (Yaz gets to do her best Alan Partridge impression by screaming "Dan?!" throughout the warehouse). The initial suspects seem to be HR head honcho Judy, or Mr. Slade (Callum Dixon), a sniveling, middle manager bully who has been keeping a tally of the missing. Corporate bigwigs abusing members of the workforce appeared to be the predictable and yet logically appropriate conclusion. However, there is a twist to the tale when the bad guy of the story turns out to be... Charlie! And this is where the episode loses me. It turns out it was the Kerblam operating system that sent out the distress message to the Doctor, not a fearful human worker. Charlie is an angry employee, fighting for the rights of human workers who have been replaced by technology. Driven to extremism, he plans to send an army of Delivery Bots out into the world to blow up Kerblam customers with explosive bubblewrap. It almost felt like the episode bottled it and backed off from its attack on big business right at the end and picked a less deserving target. Charlie, who saw his true love Kira killed due to his insane plans, is blown up himself when the Doctor reprogrammes the Delivery Bots to deliver the weaponized packages to themselves. The whole saga wraps up with Judy promising to hire more human workers in the future - as if the be all and end-all of human existence is to work for a gigantic exploitative corporation. Was big business the hero here? Obviously, nobody is condoning Charlie's actions, but the moral of the story seemed to be that the robotization of the workforce is fine because these robots have feelings too. Which, okay, but those robots also murdered innocent Kara just to send a message to Charlie. And it's not as if the Kerblam employees were being treated with respect by the higher-ups. But it seemed like The Doctor gave them her approval to keep on doing what they were doing. I don't think that was McTighe's intention, I do believe this was intended to be an anti-corporate piece, but the message got confused and turned things kind of bleak. It's a shame because the episode was well paced, and had a sense of increasing peril, something which has been seriously lacking in Chibnall's scripts. The Kerblam Men had a cool ominous vibe. There was some great worldbuilding with the warehouse; even if it was a little hard to believe 10,000 people worked there (it seemed to be about five). And explosive bubblewrap is the kind of goofy idea that only a show like Doctor Who can get away with. It was genuinely funny in places too (Charlie: "Have you smelt her?" Graham: "Strangely enough, I haven't."). If it wasn't for the muddled messaged at the end this would have probably tied "Rosa" for the best episode of the season so far. That said, flaws aside, this was a solid first outing for McTighe, who certainly has the potential to join that list of great Doctor Who writers in the future. -Yaz is still used as "expository question woman" a lot in this episode ("Are your staff highly motivated?" being the real clunker), but she also has a couple of sweet character moments, particularly in her scenes with Dan. Her request to take Dan's necklace back to his daughter shows her as the heart of Team TARDIS. -Ryan (Tosin Cole) gets to take charge at various points throughout the episode due to his experience as a warehouse worker. He also remembers his dyspraxia for the first time since episode two. That doesn't stop him from sliding down chutes and bouncing across conveyor belts though. -The Doctor is still namedropping, but this week's mention of Agatha Christie is actually a reference to the Season 4 episode "The Unicorn and the Wasp." -This could turn out to be nothing, but when the OG Delivery Bot, Twirly, scans the Doctor, it mentions her "medical condition" and recommends she have a blood test. Was that just Twirly malfunctioning and spitting out nonsense? Or does he know something we don't?